Webster University : London is a For-Profit, Non-Sectarian, Graduate, Institute established in 1995. 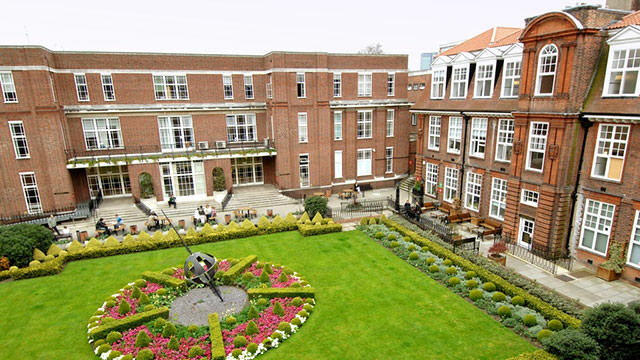 The campus is located in Regents Park, London, United Kingdom and hosts students with an endowment of $0 (2014). Horrible School, horrible teachers, unethical, liars…can go on and on. Institutions are required, contractually, to follow their own rules. Institutional documents may also be considered binding implied-n-fact contracts. Goodman v. President and Trustees of Bowdoin College (2001) has ruled that institutional documents are still contractual regardless if they have a disclaimer. Decision making should not be arbitrary or capricious / random and, thus, interfere with fairness. While this case concerned a private school, Healy v. Larsson (1974), found that what applied to private intuitions applied also to public. Verbal contracts are binding. They must be made in an official capacity, however, to be binding.] Dezick v. Umpqua Community College (1979) found a student was compensated because classes offered orally by the dean were not provided. Healy v. Larsson (1974) found that a student who completed degree requirements prescribed by an academic advisor was entitled to a degree on the basis that this was an implied contract. An advisor should, thus, be considered an official source of information. Right to contract rights Carr v. St. Johns University (1962) and Healey v. Larsson (1971, 1974) established that students and institutions of higher education formed a contractual relationship. Institutions of higher education are responsible to ensure that contracts, including those implied and verbal, are fair (Bach, 2003; Anderson v. Mass. Inst of Tech, 1995), in good faith (Kaplan & Lee, 2011; Beukas v. Fairleigh, 1991, 1992) and not unconscionable (Kaplan & Lee, 2011; Albert Merrill School v. Godoy, 1974). I had my meeting on Monday 4/13/2015 at 130pm. In this meeting I was given a bunch of fluff about how much they care about us and want to try to make the situation better and blamed Regent’s for trying to get their own accreditation through the government though after many attempts they admitted that anyone can get accreditation no matter their affiliation and had no bearing on our current situation, though they were denied accreditation I think because of their relationship with Webster. What they then offered was $7,500 for the whole year as a balance due to Webster, not a loan. They stressed the fact that this is not a loan and does not incur interest. More over this amount only covers half of a semester in a year so there is a large chunk not accounted for especially for those students who use plus loans for living expenses. The other major catch is that in order to make sure we pay back this ‘credit’ they will hold on to our official transcripts until the amount is paid in full. We will get our diploma but not our transcripts and there will be a ten year payback plan. After they were done telling me there solution I proceeded to tell them my personal situation; no private loans and Visa expiration etc. etc. Their response offer then, was for me to transfer to one of their other campuses, but only earn my American degree. I responded with a no because I have put myself in $100,000 debt to get a British and American degree and if just an American degree would suffice I would have stayed in the states and done it for a lot less money. Then they came back with the offer to match in total the amount I would have got from FAFSA including the Pell grant amount of (approx.) $6,000 a year that I get awarded, proving my mother fails a credit check for a private loan (Which she will do as she only works 35 hours a week at 7$ an hour because she takes care of my Grandfather. She already has an outstanding debt due to the CC companies as well as a private loan we got when I first arrived here in London in 2011. Trying to renew this loan is how we found out that she couldn’t co-sign again- I have no other persons.) but still keeping my transcripts until I pay it all back. I told him that he knew as well as I do that many jobs in the business world would ask to see my transcripts and how was this to help me get a good enough job to pay off all my loans and that this deal was not good enough. I then proceeded to recite to them the laws and rights I inserted above which completely changed the tone of the meeting. They responded with ‘well it’s nice to recite law and all but this is the federal government and the federal government always win’ as you can see things got tense and I felt bullied from here on out. I explained to them that I have emails stating that I can get FAFSA and that I can get a dual degree and these are considered binding and that I am not going after the Federal government as they had every right to take away their ability for dispersing out loans to us and that Webster is responsible for not complying with the laws and rules of the Federal government and it is their responsibility to make it right, as they publicly advertised they had the ability to do this. I kept strong as they continued to try to make me waver and confuse me but many students who did not know their rights went into the meeting and got bullied and were told that they are not under a contract with Webster. There are also many students who applied to Webster in August and came over in Sept to start school under the assumption they could get FAFSA and plus loans when Webster already knew they couldn’t and did not inform them of this until after they arrived here in London. Furthermore Webster has cancelled their contract with Regents and any student who graduates after December 2016 will not receive the dual degree even if they were previously told they would. I cannot imagine that any of this is actually legal. And if I sign their deal it will be under duress as I have no other option for graduating and getting my dual degree at this time. Terrible school, terrible admisitravtive staff. Avoid at all costs. I will be releasing many stories very soon and get everyone up to date on the situation here in London, their are about 50 American severely affected currently. We are not receiving our Federal student aid and are not given any alternatives. I do have a petition going right now on my facebook (Mehran Karim). please go sign and share it. I will have updates on other situation emailed to College Times as soon as I can. The issues regarding my situation in university is not just centred on Webster but in fact is a bit more complex and is a result of malpractice and bad decision making from three universities, the malpractice began two months into my university experience in London, starting January 2013. My brother Imran and I are both going through the same problems. We joined American Intercontinental University London expecting a dual degree (British and American degree accreditation) in a diverse city with the opportunity to become truly global professionals in a globalized world. This experience has spiralled out of control in many ways due to malpractices by three universities; American Intercontinental University London (CEC Corporation), Regents University London, and Webster University. Within two months of our studies we were told that our University had been bought by Regents University London. Prior to this we had no understanding of the situation; when signing up to AIUL we had not been told of an ongoing acquisition procedure. We had signed a contract with AIUL to study for four years and a certain number of credit hours; this was broken with no consideration for the students. My brother and I decided to stay in AIUL for another year under their teach-out program before officially transferring to Regents. As expected from the universities, students remained complacent and did not mind the acquisition due to the promises made by both universities (usually by word of mouth); prices would not go up, dual degree would be continued, credits would also be accepted. All of these promises came with some twists; the prices would go up by 4% yearly for inflation adjustment (although inflation is not at this rate) , dual degrees would be given only to the Regents American College London students (excluding all students that required government aid and were not Americans, as only American federal aid was processed and no other forms of government aid was accessible), and core classes would not necessarily transfer as core classes which has made it so that some students like myself have to study beyond the credit requirements to receive their degrees and in turn costing them more for the degree. When summer 2014 came we officially transferred and began our summer courses in Regents. It initially seemed fine and looked like everything was going to be okay because we were told that the finances would be taken care of as normal and FAFSA would be accepted (told to us by our AIUL financial advisor who now works for Regents). The expectation of a dual degree was also intact. We finished up our FAFSA application, went through a lengthy process of extra paper work for Webster, which was filled with varying levels of miscommunication. We never had this experience with applying for financial aid under AIUL and the new expectations for receiving financial aid were never made clear to us in the beginning. The new expectations were understandable, just horribly communicated. Finally after a month of our summer term finishing we received our loans and it showed in our NSLDS (National Student Loan Data System). But even then they wouldn’t release the loan, putting our relationship with our landlord on the brink. This eventually led to our eviction, although the payment was made to the landlord. The eviction was a clear fault of the school and indicated the lack of administrative abilities. The original eviction notice was given to our finance director, who chose to ignore it and keep us uninformed. Two weeks into the eviction we were informed merely by coincidence after running into an employee who told us that we had to leave in a couple of weeks. Being that it was almost the start of a new school year, finding flats with the correct terms in London was very complicated and we needed all the time we could get; two weeks in a place like London is not enough time. We went homeless for nearly 48 hours and were severely stressed with a total loss of trust in the schooling system. The difficult search was not completed until the day school started. On the day of school we decided to accept the terms for a flat that did not meet basic needs. The flat lacked essential amenities and had mould everywhere with no ventilation. This damaged our health and mental wellness, but it was the best we could afford given the circumstances the school had put us in. When we had thought everything was finally under control and that we could continue studying and have a fairly normal student experience, we were hit with a letter from the president of Webster, Beth Stroble, and the vice chancellor of Regents, Aldwyn Cooper. It stated that “the U.S. Department of Education has made a decision that may affect the way in which you receive your financial support….The amount of funds you receive will be unchanged; it will now just come from a different source….Due to a request made by the American Department of Education we are making an administrative change to the nature of funding support for those of our American students who have been in receipt of, or have applied for U.S. financial aid to study on the Webster University US degree programs at Regent`s [Regents American College London]. Funds are being made available to ensure that your education and student experience remain unaffected. We expect it will take few months to implement the new processes and to embed those processes.” The loans which had been processed for our studies had now been reversed and the slow process of pushing for a bare minimum amount of funding from Regents and Webster began. We never received the amount of funding we should normally have, in fact the amount never accrued to what was legally required for our visas and is still not meeting this requirement. All students were told to apply for loans as we normally would through FAFSA, except it would now be done with Regents as the school we use. This of course did not work out and we were told of it failing just before the start of our spring term, giving all of us students the false hope of everything being ok. Had my brother and I known that the school would not be able to process federal loans, we would have used our comfortable vacation time to progress the fight for our rights. The free time was strategically taken from us, thus disabling our capacity for holding the school responsible for their wrongdoings. Nearing the end of our spring term, many students were told to transfer campuses or alternatively apply for private loans. Private loans are complicated and are rarely favourable compared to federal loans. Transferring campuses meant that we could not receive our dual degrees. Due to our mother not working and our father not having any income from personal complications, my brother and I are not even eligible for private loans. The school has offered all students the equivalent of their eligibility for Federal Stafford Loans and Pell Grants as a loan. Thus in our case making it so the original $5775 we would receive as grants to be turned into a loan by the school. This loan is without interest and the school did make clear that it would not be considered a loan and is only a “balance due on your Webster University student account”. Even still this credit amount does not come close to covering our costs of studying and completely disregards the original communications made to us about how our experience, studies and funding amounts would not be affected. I am currently legally homeless in a foreign country. I sent the school an email stating this and they have not yet replied and don’t seem to care much. The school is giving me no option but to give up and leave to another university. With that I would lose everything I have put into my education. I would lose the time I have put in, I would lose the money I have put in, foremost and finally I would lose access to my dual degree. Nelson Mandela once said “education is the most powerful weapon which you can use to change the world”. I personally understand that my future professional opportunities would not be severely affected by this situation if I opted to not receive the dual degree and transferred campuses…..but the fight against the school is on the grounds of principles. Our right to a fair and just education is important and it is the one thing that we as Americans and British alike, cannot allow to whither. It is our only chance at keeping our place in this hyper-globalized world. The student culture is getting weaker every decade and education is not given enough appreciation. I want to stand up against this rogue university and make a point to all students that our right to a fair and just education should never be tampered with. Students must understand that they are the ones in control and no university can toss them around as they please. A university should never be allowed to continue in such a manner. Webster and Regents should have known they were breaking regulations by running in the manner they were. They have jeopardised our education and must be held responsible, not only for my benefit or the students currently affected but for the benefit of students in the future and for benefit of our student culture. Students must wake up and understand that they are the future of our world and the ones in control. If we as students cannot stand up to the wrongdoings of our universities and hold them responsible for any wrongful acts, how could we ever hope to stand up to our governments and hold them responsible for any wrongful acts? And as we are entering this newly hyper-globalized world, the current generation of students will have to stand up against entities larger and stronger than our current governments. Giving up is not a choice.